Precious metals futures climbed for a second day in a row Thursday with gains of 1.8% for palladium and 0.7% each for gold, silver and platinum. Gold for December delivery tacked on $9.50 to settle at $1,292.40 an ounce on the Comex division of the New York Mercantile Exchange. "Gold is likely to breach USD 1,300/oz as the market prices in a less hawkish Fed, particularly in a risk-off environment," Reuters quoted analysts at Standard Chartered. Gold futures traded from a low of $1,286.40 to a high of $1,296. They climbed 0.3% in the previous session, slipped 0.8% on Tuesday and declined 0.3% in their start to the week on Monday. Silver for September delivery added 11.3 cents to settle at $17.053 an ounce. Silver futures ranged from $16.96 to $17.18. They advanced 1.4% on Wednesday, tumbled 2.4% on Tuesday and gained 0.3% on Monday to settle at their best level since June 14. October platinum rose $7.20 to $981.70 an ounce, trading between $974.30 and $985.10. 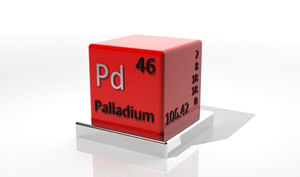 Palladium for September delivery rallied $15.95 to $926.15 an ounce, ranging from $917.20 to $932. The close was the highest since early 2001. Gold gained $12.40, or 1%, to 1,285.15 an ounce. Silver jumped 34 cents, or 2%, to $17.02 an ounce. United States Mint bullion sales were unchanged as of 3:36 p.m. ET. Below is a sales breakdown of U.S. bullion products with columns listing the number of coins sold during varying periods. Products with an asterisk (*) are no longer available.